Nick Brandt’s portraits of East African wildlife are shot in crisp, metallic black and white, but they capture a dynamic informality in their subjects. It’s as if the creatures Brandt encounters are unaware of his presence and have not had time to arrange themselves at their best. 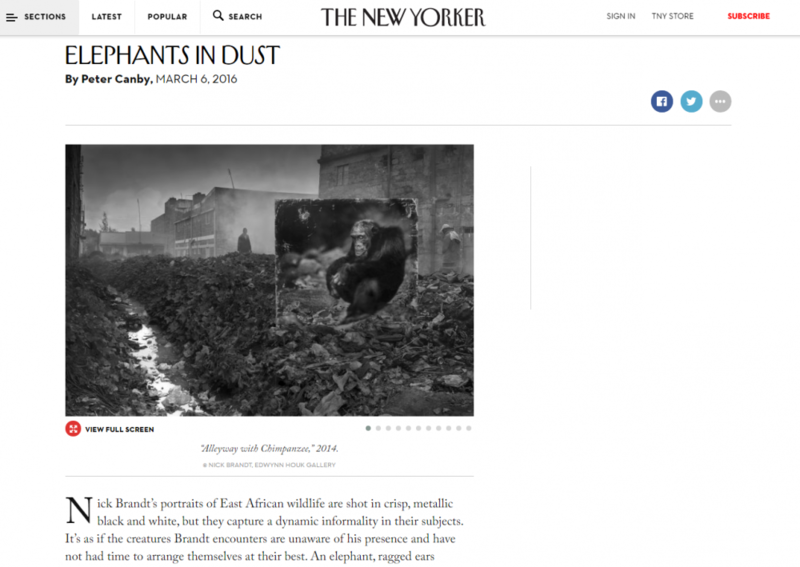 An elephant, ragged ears flapping, shuffles toward the camera, weighed down by broken tusks. A rhinoceros in profile displays a hide covered with nicks and gashes. A buffalo peers into the camera, one of its eyes swollen nearly shut. An ostrich egg, mysteriously abandoned on a mud flat, seems destined to petrify in the light of a distant sunset. Brandt’s photographs, which at first glance can seem static, are in fact suffused with movement and with a sense of the ephemeral quality of life.